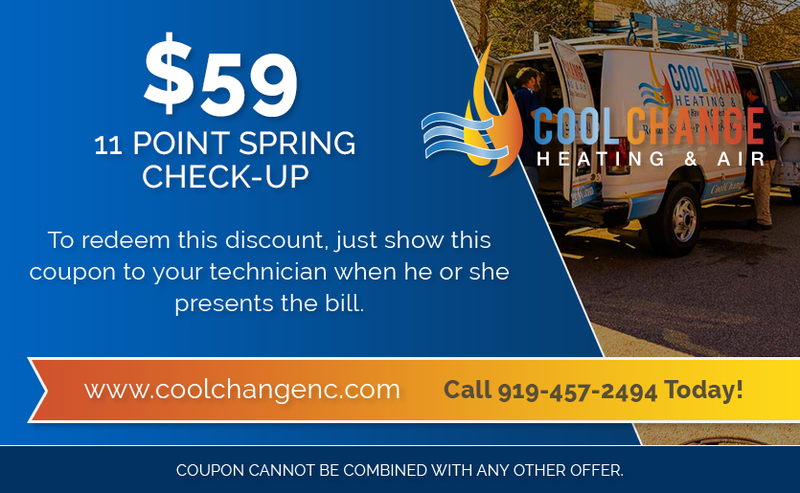 Redeem Your AC Repair Discount Today! Need your Raleigh, NC Air Conditioner repaired ASAP? Your whole heating and cooling system checked? Or your furnace or heat pump fixed? Redeem your HVAC discount today! No matter the Raleigh weather, you deserve to be comfortable in your home. Cool Change Heating & Air Conditioning is a full service HVAC company committed to excellence. We provide top quality service at a fair price! Call us today! We're your HVAC Repair Experts for Raleigh, Wake Forest, and Cary, NC.